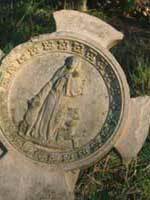 The foundation stone for St John's Home was laid by Prince Leopold (son of Queen Victoria) on 6 May 1873, on land acquired by Father Benson. 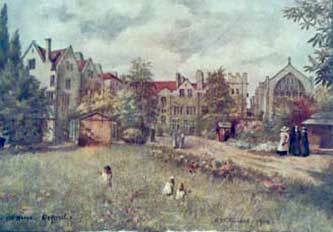 Prince Leopold was then studying at Christ Church. Also present at the foundation stone laying ceremony was the Bishop of Oxford. Leopold Street was formerly known as St John's Road but renamed soon after the ceremony. 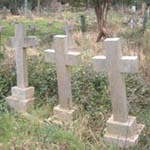 The idea of establishing the hospital originated with Miss Frances Sandford who lived in London near St Elizabeth's Home (Mortimer Street), founded by the All Saints Sisters of the Poor (ASSP) - see fact sheet on Religious Orders. Miss Sandford had previously discussed the idea with Father Benson, who was chaplain to the ASSP Community in Margaret Street. �She had received a thousand pounds from a patient suffering from an incurable disease as a contribution towards funding a 'National Hospital for Incurables.' There was no National Health Service at this time, so for poor ill people there was limited health care or treatment. It was particularly difficult for people with long-term illness and old people. For many in these circumstances the only residential place available was in the workhouse, which carried a great stigma so that people were reluctant to be admitted; they rather carried on living in inadequate conditions at home, where for many the house was cramped, damp and cold, and sanitary facilities were shared with other families. 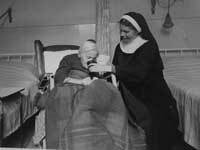 During the nineteenth century some religious orders, particularly sisterhoods, provided establishments for nursing care. 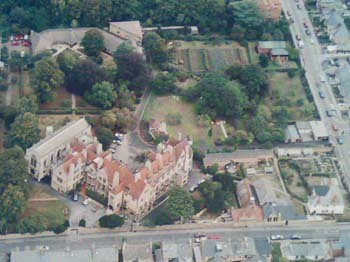 Father Benson had by this time purchased four acres of land between Cowley Road and St Mary's Road, half of which which was assigned for a graveyard and new church. On the other half there was ample room for the hospital even though a small elementary school, known as the Robin Hood School, had already been built there in 1868. The hospital was for very sick people in impoverished circumstances for whom workhouse conditions were considered unsuitable, and also for people who could contribute financially towards their own care. Miss Sandford was the lady superintendent when the hospital opened in 1874. In the early days there were concerns about the water since the east Oxford area was just developing as a residential area and services such as water were not easily available. Only a few patients were cared for at this time and financial problems led to a temporary closing of the hospital in 1879. However, it was reopened soon after under the administration of the All Saints Sisters of the Poor. 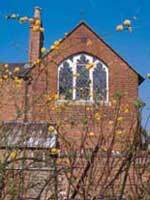 Under this new management the hospital developed and more facilities were built, such as a wing for the sisters, a laundry and eventually the chapel, designed by Ninian Comper. 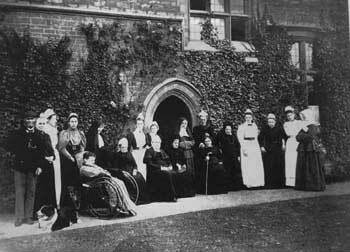 Initially the hospital took in male and female patients, but for a time it became a home for women only who were either 'incurable' or needed a long period of treatment. It became a sanctuary for women with illness or disability, mostly elderly, who had a certain amount of financial means to contribute towards their care. Alongside these residents were some very wealthy women, some of whom brought their maids. Today St John's Home continues to be a home for elderly people, men and women, who need long-term care. 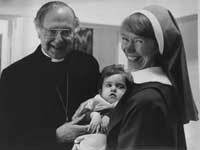 Helen House, the world's first hospice for children, was opened in November 1982. 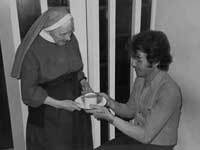 The hospice came about after Sister Frances Dominica looked after a little girl called Helen who was gravely ill and needed constant care. 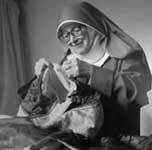 Sister Frances was Reverend Mother at the time and, after getting to know Helen's family, she arranged to look after Helen in the Convent occasionally, to give the parents a break. She realised that there were many more parents and children in this situation and, after talking to medical professionals, launched the campaign for a children's hospice. The hospice is in the same grounds as the convent and St John's Home, and provides multi-professional high level care for children suffering from life limiting conditions and their families. Now there are 42 children's hospices in the country. Douglas House, opened in February 2004, also in the grounds of the convent, is a 'Respice' for young adults aged 16 to 40 years old with life-shortening conditions. Residents here also have a high level of care in an environment that is designed for their needs, including facilities for recreation, entertainment and study. The Porch started in 1986 as a project to provide homeless people with soup and sandwiches and a place to meet. It was run from the convent by volunteers. The project has developed and now provides people with an opportunity to move towards a more positive lifestyle and away from addiction and dependency. It is based at 139 Magdalen Road and is a place where people can get friendship, hot and nutritious food, washing facilities, and the opportunity to join in learning activities. Peter Mayhew, All Saints: Birth and Growth of a Community, (Oxford: Society of All Saints, 1987, reprinted 1993). Susan Mumm, Stolen Daughters, Virgin Mothers, Anglican Sisterhoods in Victorian Britain, (London: Leicester University Press, 1999). Jeanne Lindley, Ours is a Nice House. (Leaflet).